WARNING: Travel in Libya remains dangerous. Libya continues to suffer from armed conflict and violent engagements between the UN-backed Government of National Accord (GNA), the opposition Libyan National Army (LNA), foreign military elements and competing factions within the GNA. In April 2019, the LNA attacked Tripoli, and bombed its only functioning airport. The governments of many nations recommend that their citizens avoid travel to Libya, and to leave if they are in the country. If you must travel to Libya, see War zone safety safety for important precautionary information. Libya (Arabic: ‏ليبيا Lībyā) is a country in North Africa. In the north it has a Mediterranean Sea coast, with Egypt to the east and Tunisia to the west. It also has land borders with Algeria, Chad, Niger and Sudan. More than 90% of the country is desert or semidesert. The north-eastern region on the Mediterranean Sea. Huge southern desert region with amazing scenery and some of the hottest temperatures recorded anywhere in the world. The north-western region on the Mediterranean Sea with the capital city and ancient Roman ruins. The Archaeological site of Sabratha, a UNESCO World Heritage Site on the Mediterranean coast in northwestern Libya. Archaeological evidence indicates that from as early as 8,000 BC, the coastal plain of Ancient Libya was inhabited by a Neolithic people, the Berbers, who were skilled in the domestication of cattle and the cultivation of crops. Later, the area known in modern times as Libya was also occupied by a series of other peoples, with the Phoenicians, Carthaginians, Greeks, Persian Empire, Romans, Vandals, Arabs, Turks and Byzantines ruling all or part of the area. From 1912 to 1927, the territory of Libya was known as Italian North Africa. From 1927 to 1934, the territory was split into two colonies, Italian Cyrenaica and Italian Tripolitania, run by Italian governors. During the Italian colonial period, between 20% and 50% of the Libyan population died in the struggle for independence, and some 150,000 Italians settled in Libya, constituting roughly one-fifth of the total population. In 1934, Italy adopted the name "Libya" (used by the Greeks for all of North Africa, except Egypt) as the name of the colony (made up of the three provinces of Cyrenaica, Tripolitania and Fezzan). King Idris I, Emir of Cyrenaica, led Libyan resistance to Italian occupation between the two world wars. Following Allied victories against the Italians and Germans, Tripolitania and Cyrenaica were under British administration, from 1943 to 1951, while the French controlled Fezzan. In 1944, Idris returned from exile in Cairo but declined to resume permanent residence in Cyrenaica until the removal of some aspects of foreign control in 1947. Under the terms of the 1947 peace treaty with the Allies, Italy relinquished all claims to Libya. On 1 September 1969, a small group of military officers led by then 27-year-old army officer Muammar Abu Minyar al-Gaddafi staged a coup d’état against King Idris. At the time, Idris was in Europe for medical treatment. His nephew, Crown Prince Sayyid Hasan ar-Rida al-Mahdi as-Sanussi, became King. It was clear that the revolutionary officers who had announced the deposition of King Idris did not want to appoint him over the instruments of state as King. Gaddafi was at the time only a captain and his co-conspirators were all junior officers. With the assistance of the headquarters army personnel, the group seized the Libyan military headquarters and the radio broadcasting station with only 48 rounds of revolver ammunition. Before the end of 1 September, Sayyid Hasan ar-Rida had been formally deposed by the revolutionary army officers and put under house arrest. Revolutionary officers then abolished the monarchy and proclaimed the new Libyan Arab Republic. Gaddafi was at various times referred to as the "Brother Leader and Guide of the Revolution" in government statements and the official press. In the final years leading up to the 2011 civil war, the nation was renamed the "Great Socialist People's Libyan Arab Jamahiriya" (Arabic phrasebook: الجماهيرية العربية الليبية الشعبية الاشتراكية العظمى al-Jamāhīriyyah al-‘Arabiyyah al-Lībiyyah ash-Sha‘biyyah al-Ishtirākiyyah al-‘Uẓmá), and it embodied the legacies of a system of governance that had been in power for more than 40 years. During the period 1977 to 2011, Libya was known as the "Libyan Arab Jamahiriya" at the United Nations rather than by the longer official name. In early 2011 the authority of the Libyan Arab Jamahiriya government was challenged by protesters, leading to a civil war, where NATO-led forces intervened with airstrikes, military training and material support to the rebels. On 20 October 2011 Muammar Gaddafi was killed by elements of the National Transition Council following his capture on a roadside in his hometown of Sirte. On 23 October the liberation of Libya was pronounced by the National Transition Council. After 2011, Libya soon entered a civil war due to the disputes between the several armed groups that gained power during the insurrection. In September 2012, an attack of the Ansar al-Shariah extremist group on the U.S. embassy resulted in the death of the American ambassador and other public officers. On April 2016, U.S. president Barack Obama said that failing to prepare Libya for the aftermath of the ousting of Gaddafi was "the worst mistake of his presidency". As of December 2017, Libya remains deeply politically and economically unstable. There are effectively two "governments": the Government of National Accord, based on Tripoli, which controls most of the West of the country, and the Council of Deputies, based on Tobruk, which controls most of the east. These two governments, however, have limited control over the territory, a large part of it being effectively ruled by tribal warlords and extremist groups such as ISIS and Ansar al-Shariah. There are hundreds of thousands of displaced people and food shortages are commonplace. 97% of the population is Sunni Muslim, whilst the rest include small minorities of Christian and Jewish people. Within Libya as many as five different climatic zones have been recognised, but the dominant climatic influences are Mediterranean and Saharan. In most of the coastal lowland, the climate is Mediterranean, with warm summers and mild winters. Rainfall is scanty. The weather is cooler in the highlands, and frosts occur at maximum elevations. In the desert interior the climate has very hot summers and extreme diurnal temperature ranges. Entry will be refused to citizens of Israel and to those who show stamps and/or visas from Israel. Note: On 16 December 2012, Libya decided to "temporarily" close its borders with Sudan, Chad, Niger, & Algeria with the purported aim of stifling traffic in illegal immigrants, drugs, and armed groups (including those associated with al Qaeada and other extremists). The southern regions Ghadames, Ghat, Obari, Al-Shati, Sebha, Murzuq and Kufra have been declared "closed military zones to be ruled under emergency law". Even in better times these borders were considered risky due to armed bandits and criminals associated with human and drug trafficking. Passports and visas are required for entry into Libya for all nationalities except nationals of Algeria, Egypt, Jordan, Mauritania, Morocco, Syria, Tunisia and Turkey. Those who have passports indicating travel to Israel will not be allowed to enter. Libyan immigration requirements frequently change without warning. According to the U.S. State Department, a requirement of a certified Arabic translation of the biological data page of your passport is mandatory for obtaining a visa and entering the country. Libyan authorities no longer require an Arabic translation of the ID page. Due to the conflict in Libya during 2011, the appointment of diplomatic representation outside Libya has been somewhat confused. Careful attention should be paid to the current standing of the foreign mission and its appointed representatives if travel documentation to enter Libya needs to be sought from a Libyan embassy or consulate. Tourists arriving as a group, as part of a package organised by travel and tourist bureaus, agencies or companies, which cover their living expenses during their stay. Those in possession of student entry visas with expenses paid by the Libyan Government. Ever since the civil war began, air operations have become quite unreliable as airports are repeatedly closed and opened again depending on the level of violence in the area. In April 2019, an offensive to take Tripoli has effectively made Western Libya a no-fly zone and rendered both airports inoperational. All flights to the city are being diverted elsewhere. Libyan Airlines and Afriqiyah Airways are the main airlines of the country, however all operations are uncertain. The Tripoli International Airport (TIP IATA) (Arabic: مطار طرابلس العالمي), is the nation's largest airport and is in the town of Ben Ghashir 34 km (21 mi) south of the Tripoli city centre; it was operating again as a hub for Afriqiyah Airways, but has now closed due to fighting. Nine airlines provide limited flights from the Tripoli International Airport to regional international destinations. The Mitiga International Airport. (MJI IATA) is about 8 km (5 mi) east of Tripoli's city centre, and was an alternative when TIP was closed. It is also closed due to airstrikes. 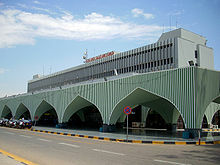 The Benina International Airport, (BEN IATA), (Arabic: مطار بنينة الدولي) is in the town of Benina, 19 km east of Benghazi. The airport has limited services: Afriqiyah Airways to Tripoli and Misrata, Libyan Airlines to Alexandria, Cairo, Tripoli and Tunis, Qatar Airways to Doha, Royal Jordanian to Amman-(Queen Alia), Turkish Airlines to Istanbul-(Ataturk) and Tunisairto is flying to Tunis. Libya has no international train connections and no domestic train infrastructure. For travel to Libya overland, there are bus and "shared taxi" (accommodating 6 people in a station wagon) services from such places as Tunis, Alexandria, Cairo and Djerba. There are accounts of people having done the trip in their own 4x4s or using their own dirt bikes and campervans. There are very few border posts open to travel into the country with a foreign car: Ras Jdayr (from Tunisia) and Bay of As Sallum (from Egypt). At the border, you must buy a temporary licence including a number plate. There are bus services to Tunisia and Egypt. Previous scheduled services may take an extended time to restore, please ensure your travel is through a stable area before boarding any service. There are ferries connecting the Libyan city of Tripoli with Malta and Sfax, Tunisia. Previous scheduled services may take an extended time to restore, please check before ticketing for any service. Libya has had no train system since 1965. Prior to the civil war many travellers undertook the trip in their own 4x4s or using their own dirt bikes and campervans. It would seem that they encountered considerable hospitality once in the country. It was not uncommon to see convoys of European campervans on Libya's highways prior to the civil war. Please make serious and detailed enquiries prior to undertaking any trip by road into Libya to determine if the area you will be travelling through is safe and if fuel and other services are available. Travel such as this is not recommended. Some self-drive car rental services are available in the large cities but the rates were typically high and the cars unreliable. Avis and Europcar provide rental cars. Around the major cities, driving can be an "education", although driving standards are not as bad as in other countries in the region. The recommended method of transport for tourists around major towns is taxis. There are also many shared taxis and buses. The small black and white taxis (or death pandas) tend to be safer (more cautious drivers) but learn the term "Shweyah-Shweyah", Libyan for slow-down, and ask them to keep off Al-Sareyah (the motorway from Souq-Al-Thataltha to Janzour)! A taxi driver will routinely try it on with tourists. Will always try to charge 10 dinars for a fare around town. Negotiate the price first. If you find a good taxi driver with a good car, it doesn't hurt to build up a relationship and get his mobile number. Taxis from the airport can be more expensive as the airport is a long way from town. The Corinthia Hotel runs a shuttle from the airport to the hotel. Longer journeys such as Tripoli to Benghazi will take about 14 hours by bus. The buses make stops for meals and the very important tea (shahee) breaks along the way. A faster method is to take the "shared taxis" but some of the drivers tend to be more reckless in order to cut the travel time. Services such as inter-city bus services have been seriously disrupted or halted due to the civil unrest and armed conflict. Travel by long distance bus services in Libya is not recommended. If travelling by road in post liberation Libya very high levels of situational awareness should be practised at all times. Fuel supplies and vehicle repair services may be disrupted and some roads and bridges may be damaged. Armed groups and dis-affected individuals, armed militias and detachments of foreign military and military contractors are active throughout Libya. The opportunity to inadvertently become involved in a violent confrontation or robbery is much higher than in many other countries in the region and caution should be exercised. If in doubt stop and take cover or if possible immediately depart the area to a safer location. Standard Arabic is the official language, but the native language is Libyan Arabic. It is important to know that Arabic languages are mutually unintelligible, just like Chinese languages, but since Libyans learn Standard Arabic in school, foreign Arabs should be able to be understood. English is widely understood especially by young residents of Tripoli, while older people are likely to speak Italian as a result of Libya's Italian colonial past, and even among younger people it is the second most known foreign language after English because of access to Italian television. Libyan Arabic is influenced by Italian, such as "semaforo" (traffic light) and "benzina" (gasoline). Various Berber languages, such as Nafusi, Touareg and Ghadames, are used in nomadic and many small urban settings. Speakers of those languages will often be multilingual and be able to converse in Libyan Arabic and sometimes Standard Arabic as well. Libya's colourful capital Tripoli makes for a great start to explore the country, as it still has its traditional walled medina to explore, as well as the interesting Red Castle Museum, with expositions on all parts of the region's history. Despite the development as a tourist destination, this remains a quintessentially North-African place, with a range of beautiful mosques and impressive fountains and statues to remind of its historic role in the great Ottoman Empire. Some 130 km from the capital is Leptis Magna ('Arabic: لَبْدَة), once a prominent city of the Roman Empire. Its ruins are located in Al Khums, on the coast where the Wadi Lebda meets the sea. The site is one of the most spectacular and unspoiled Roman ruins in the Mediterranean. Another must-see is Cyrene, an ancient colony founded in 630 BC as a settlement of Greeks from the Greek island of Theraand. It was then a Roman city in the time of Sulla (c. 85 BC) and now an archaeological site near the village of present-day Shahhat and Albayda. The vast Sahara makes for some excellent natural experiences, complete with picture-perfect oases like Ubari. The Unesco listed town of Ghadames was once a Phoenician trade town, and the ruins of its ancient theatre, church and temples are a major attraction today. For stunning landscapes, try the Acacus Mountains, a desert mountain range with sand dunes and impressive ravines. The varied cave paintings of animals and men that were found here have earned the area recognition as a Unesco World Heritage Site too. The Libyan currency is the Libyan dinar, denoted by the symbol "ل.د" or "LD" (ISO code: LYD). The dinar is subdivided into 1000 dirham. Banknotes are issued in 1, 5, 10, 20, and 50 dinar denominations. Coins are issued in 50, 100 dirhams, ¼, and ½ dinar denominations. ATM cards are widely used in Tripoli more other areas and most big name stores and some coffee lounges accept major cards. Check that your card is going to work before leaving major centres as previous networks and ATM facilities may be damaged or missing. The Libyan economy during the Libyan Arab Jamahiriya era depended primarily upon revenues from the oil sector, which contributed about 95% of export earnings, about one-quarter of GDP, and 60% of public sector wages. Substantial revenues from the energy sector, coupled with a small population, gave Libya one of the highest per capita GDPs in Africa. Libyan Arab Jamahiriya officials made progress on economic reforms in last four years of their administration as part of a broader campaign to reintegrate the country into the international fold. This effort picked up steam after UN sanctions were lifted in September 2003 and as Libya announced that it would abandon programs to build weapons of mass destruction in December 2003. Almost all US unilateral sanctions against Libya were lifted in April 2004, helping Libya attract more foreign direct investment, mostly in the energy sector. Libya applied for World Trade Organization membership, reduced some subsidies and announced plans for some privatisation of state-owned companies. The former Libyan government invested heavily in African projects including large scale telecommunications and other major international infrastructure and development programs. Sanctions were re-applied in 2001. In 2011 actions by domestic insurgents and foreign military forces effectively closed down the normal functions of civil administration during the civil war period. The NTC provisional administration has gained limited access to Libya's foreign reserve holdings and other assets. Revenue from crude oil sales have been redirected to them. A favourite cafe for the local expatriate community is the fish restaurant in the souq. For the equivalent of a few US dollars, you can enjoy a great seafood couscous. A local speciality is the stuffed calamari. Also recommend Al-Saraya: Food OK, but its attraction is its position, right in Martyr's Square (Gaddafi name: Green Square). Another good seafood restaurant is Al-Morgan, next to the Algiers Mosque, near 1st of September Street. ₵ The flashy looking big fast-food outlets are a relatively recent arrival in Tripoli. These are not quite the multinationals but a close copy of them! They are springing up in the Gargaresh Road area -- a big shopping area in the western suburbs of Tripoli. Try one of the best local catch fish named "werata" grilled or baked with local herbs and spices. Tea is the most common drink in Libya. Green tea and "red" tea are served almost everywhere from small cups, usually sweetened. Mint is sometimes mixed in with the tea, especially after meals. Coffee is traditionally served Turkish style: strong, from small cups, no cream. Most coffee shops in the larger cities have espresso machines that will make espresso, cappuccino, and such. Quality varies, so ask locals for the best one around. Alcohol is officially banned in Libya, though in reality, alcohol is readily available through a local black market (anything from whiskey to beer to wine). Penalties for unlawful purchase can be quite stiff. Travellers should always exercise appropriate common sense with respect to local laws, local sensitivities and traditions. Major cities have a range of accommodations available, from shabby hotels to 4 star establishments. Prices vary accordingly. In Tripoli, there are a couple of international-standard hotels: the Radisson Blu opened in 2009/2010 and offer excellent accommodations and services, while the older Corinthia Hotel, is located adjacent to the old city (The Medina or "Al Souq Al Qadeem"). Other hotels are Bab-Al-Bahr, Al-Kabir, and El-Mahari. Several smaller hotels have opened around town, such as Zumit Hotel  [formerly dead link], an old, beautifully renovated hotel, next to the Old Roman Arch in Bab-Al-Bahr. Manara Hotel, a tidy 4 star hotel in Jabal Akhdir, east of Benghazi, is next to the ancient Greek ruins of Appolonia Port. While it seems to be diminishing with the arrival of more tourists every year, Libyans have a strong tradition of taking travellers into their own homes and lavishing hospitality on them. This is certainly true in smaller towns and villages. There are several good hotels in Tripoli's Dhahra area, near the church like Marhaba hotel. Youth Hostels, associated with the IYH Federation (HI), are available. Please contact the Libyan Youth Hostel Association, ☎ +218 21 4445171. Learn more about Libya's UNESCO World Heritage Sites. The security situation in Libya has improved significantly. However, care is still recommended and some areas should be considered out of reach for visitors. Non-essential travel to Libya, especially outside of Tripoli is still best avoided. Gay and lesbian tourists should be careful and self-aware because homosexuality is a crime in Libya. Avoid wearing green clothes as much as possible: this color might provoke somebody because it represents the old regime. This is especially true in Misurata city. Not all bottled water is safe in Libya. Do inquire about the safest brands available. You can often purchase foreign brands when necessary. The former name of the country 'Libyan Arab Jamahiriya' was adopted by Muammar Gaddafi. Using this name may cause offence to Libyans. Most people are doing their best to erase this name from their history. Car registration plates invariably have the name sprayed out or covered with a new flag. If you're planning to travel to Libya during Ramadan, consider reading Travelling during Ramadan. Embassies and consular services. Many foreign missions in Libya remain closed or have very limited consular services available due to the civil war hostilities, others were damaged or closed and have not yet restored services, or the question of diplomatic recognition during transitional administration remains unresolved. The Venezuelan embassy in Tripoli was ransacked and looted by rebel forces and others including the UK embassy were also damaged. Many parts of Libya are under the control of the National Transitional Council (NTC), other parts of the nation have either no administration or are getting by with individual ad-hoc arrangements. Some nations have given the NTC a level of recognition equivalent to that afforded to the government of a nation state, others are recognising the state of Libya and have accepted representation of that state by the NTC, others have agreed to engage in dialogue with the NTC. Some other nations have refused to recognise the NTC at all and either still formally recognise diplomatic arrangements with the Libyan Arab Jamahiriya or have suspended diplomatic relationships whilst awaiting the formation of an interim government in Libya. Nations such as Australia, Canada, Germany, Netherlands, and the United Kingdom never recognise governments anyway and only recognise a nation so their situation is less ambiguous, in most cases they have accepted diplomatic envoys from the NTC to replace the previous diplomatic staff. In some Libyan foreign missions and at the UN the encumbrant representative of the Libyan Arab Jamahiriya government is still recognised by the host nation but now represents the Libyan nation in transition, providing either formal, or quasi-formal recognition of the NTC as a provisional administration. If needing to travel to Libya it is important to determine the status of the representative Libyan foreign mission you are dealing with and ensure that any required documentation is acceptable for travel to Libya, for entry into the country, and for any subsequently travel to the part of Libya which you may wish to enter. If requiring assistance from your nations consular representatives, it may be possible to seek them out in a country adjoining Libya or from a partnered nation if a citizen of an EU state. Australia refers their citizens to the Australian embassy in Rome, while Canada and the United States of America refer their citizens to their embassies in Tunis. This country travel guide to Libya is an outline and may need more content. It has a template, but there is not enough information present. If there are Cities and Other destinations listed, they may not all be at usable status or there may not be a valid regional structure and a "Get in" section describing all of the typical ways to get here. Please plunge forward and help it grow! This travel guide page was last edited at 22:04, on 12 April 2019 by Wikivoyage user Ground Zero. Based on work by Wikivoyage users MSG17, Mx. Granger, Traveler100bot, Ikan Kekek, SelfieCity, Kiaora, Wrh2Bot and AndreeBot, Wikivoyage anonymous user 95.247.0.74 and others.